Writer Christine Baumgarthuber has a really interesting article in the June issue of Dissent magazine about what working-class Victorians ate, and how their diets (and health) changed with the introduction of relative convenience foods, cheaper sugar, and margarine. Sometime in the 1860s the enterprising French chemist Hippolyte Mège-Mouriès made an important discovery. He took a pound of beef tallow soaked beforehand in a solution of 15 percent common salt and 1 percent sulfate of soda, slowly rendered it at 103 degrees Fahrenheit, poured in gastric juices of a pig, and sprinkled it with biphosphate of lime. This curdled mixture he spun in a centrifuge before adding a splash of cream. The resulting opalescent, jelly-like substance tasted much like butter. This substance not only won Mège-Mouriès a prize offered by Emperor Napoleon III, who desperately sought a cheap, long-lasting, and easy-to-produce substitute for butter to feed the poor and his antsy army; it also secured him a place in history as the father of oleomargarine, which he patented in 1869. Two years later he sold the patent. Not long after a German pharmacist, who adapted the Frenchman’s formula, commenced its industrial production by establishing the Benedict Klein Margarinewerke. I grew up eating mostly margarine, rather than butter. In my memory, that's what all of my friends at as well. In fact, I distinctly remember reading Matilda for the first time in grade school and being confused by the book's portrayal of eating margarine as a sign that someone was truly poor. From my perspective back then, butter was a hard, un-spreadable, depressing thing that you only bought when you couldn't afford a tub of Country Crock. That personal memory made the article really interesting for me, as it traces the history of why margarine was food-for-the-poor. It also adds some background to that Matilda memory by quoting some contemporary public moralizing from the UK about poor people and their dietary choices. 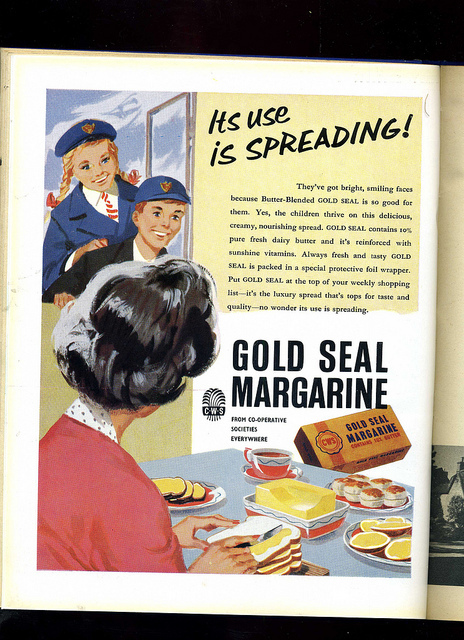 Since growing up, I've been able to put my childhood confusion into context in a number of ways, but this is the first time I've read some real background on the history of margarine in a cultural context. Really neat!